The earlier you plan your new landscape design, the earlier your team can get started on perfecting your outdoor space for the year. While dropping temperatures in Maryland may have you staying indoors with a good book, now is an excellent time to prepare your outdoor space for warmer weather though. Don’t break out the gardening gloves just yet! Instead, there are so many reasons to enjoy planning your landscape from the comfort of your cozy spot in the living room. 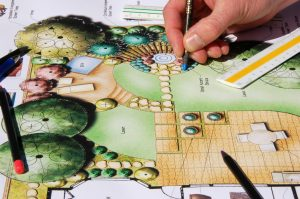 As you are mapping out your perfect landscape for 2019, consider the many reasons why now is the time to plan your beautiful landscape for spring. The earlier you plan your new landscape design, the earlier your team can get started on perfecting your outdoor space for the year. The later months of winter, along with the earlier weeks of spring, are perfect for starting on your new landscape design once you have a plan in mind. Dormant plans are easier to work with, and designing your landscape earlier will allow your landscaping team to complete your design with less foliage and weeds in the way. Although the lack of vegetation outdoors may seem dull and grey, the winter months present a perfect opportunity to visualize your landscape design options on a blank canvas. This opportunity will allow you to determine your landscape must-haves, as well as show you the amount of space that you have for fun additions along the way. Consider the plants, colors, and structures that you want to incorporate into your outdoor space for spring as you plan. Rather than spending the warm, first weeks of spring waiting for your landscape to be complete, an early start on your landscape design will allow you to enjoy your outdoor space as soon as possible. Get outside on the first warm day of March and soak up plenty of time in your landscape! With the right planning and a team of professionals behind your landscape design, your dream outdoor space will come to life in no time. This entry was posted on Thursday, November 15th, 2018 at 4:41 pm. Both comments and pings are currently closed.